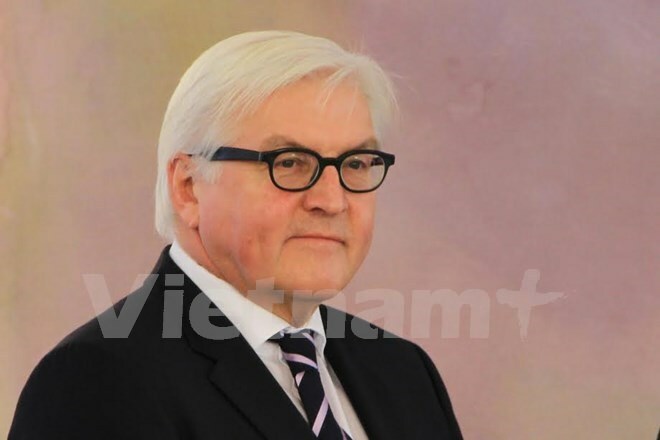 Berlin (VNA) – German Foreign Minister Frank-Walter Steinmeier is on a three-day visit to Vietnam from October 30, aiming at strengthening stratic partnership between the two countries. The Foreign Minister has granted an exclusive interview to Vietnam News Agency correspondents in Berlin ahead of his visit to Vietnam. Following the full text of the interview. “Reporter: Foreign Minister, how would you describe relations between our two countries today, 41 years after the establishment of diplomatic relations and, in particular, five years after the start of the strategic partnership? Steinmeier: We do not only enjoy excellent political and economic relations with Vietnam – we are also united by a profound and sincere friendship. One reason that Germany and Vietnam are so close is because a large number of Vietnamese people live or have lived in Germany. At the same time, more and more Germans are interested in visiting Vietnam and getting to know this beautiful country. These people form a particularly strong bond between our two countries. In 2011, we launched a strategic partnership between Germany and Vietnam in the Joint Declaration of Hanoi. This has led to a wide ranging and closely knit network of cooperation. Trade and economic affairs are obviously a key area. We want to help Vietnam to achieve even better value added and greater sustainability in its growth model. This is why we also provide support in vocational training, energy policy and environment and resource protection. In addition, we are supporting the reform process via a rule of law dialogue in which we are focusing in particular on the legislative reforms under the new constitution and on modern criminal proceedings. Political dialogue on regional and international topics is also becoming increasingly important in our relations. I welcome Vietnam’s greater foreign policy openness and growing international role – this reflects the country’s increasing importance. Reporter: You will travel to Vietnam at the start of the week. What are your hopes for this visit? What can and should our two countries do in order to improve and promote the strategic partnership in the coming years, especially as regards trade and economic affairs? Steinmeier: We enjoy close economic relations. Germany is Vietnam’s largest trading partner in the EU. German companies are helping to boost the Vietnamese economy through targeted and high-quality investments. There is scope for us to expand these economic and trade relations. The free trade agreement between the EU and Vietnam will unleash further potential. The Vietnamese Government has made good headway in the negotiations and has also shown political courage as regards further modernising and integrating the Vietnamese economy in global markets. We are keen to see this agreement enter into force soon so that both sides can benefit from better market access to goods and services. In this context, we want to achieve a further aim, that is, to set up a German Vietnamese Chamber of Commerce. This also has the goal of better market access and closer ties for both sides. From many talks with business people, I know that German companies are very interested in playing an even greater role in Vietnam, where they appreciate people’s industriousness and ambition. At the same time, it is of course important that companies know they can rely on there being the right parameters in Vietnam when they decide to invest. We encourage Vietnam to continue resolutely on its reform path. We hope that a German-Vietnamese Chamber of Commerce will provide companies from both sides with information and reliability and encourage them to invest. Reporter: How do you view the security situation in the Asia Pacific region, particularly as regards the latest conflicts in the South China Sea? What would you suggest as ways to resolve the disputes in the South China Sea? Steinmeier: Unlike other regions of the world, the Asia Pacific region is fortunate not to be afflicted by wars and conflicts. Nevertheless, we view some developments in the region with a certain amount of concern – irresponsible nuclear and missile tests by North Korea, tensions in the East and South China Sea, and an unmistakeable arms race increase the risks of escalation or “hot conflicts”. No one stands to benefit from the situation escalating in the South China Sea. We have a great interest in upholding free sea lanes, stability and peace in the South China Sea. A rules-based order which, among other things, underlines the universal applicability of the United Nations Convention on the Law of the Sea, is crucial. The International Tribunal for the Law of the Sea has made a clear statement.